Giving back to the community not only feels good but it can pay off, as Shawnelle Blackbird-Riley, an Indigenous student at Wilfrid Laurier University, knows. She received a 2017/18 Shared Universities Native Development and Navigation Committee (SUNDANCe) Award for Indigenous students for her commitment to youth in her home community of the Munsee-Delaware Nation, near London, Ontario. The award is granted to full-time Indigenous students attending Wilfrid Laurier University, Martin Luther University College, the University of Waterloo and its affiliated colleges, and the University of Guelph who demonstrate active involvement within the Indigenous community. Students may apply for the award each academic year. The deadline to apply for a 2018/19 SUNDANCe award is Feb. 15, 2019. For the last several summers, Blackbird-Riley has organized summer activities – like dodgeball and crafts – for children on the Munsee-Delaware reserve. She participated in similar volunteer-led activities as a child and remembers how much fun she had. Volunteering her time to benefit Munsee-Delaware youth is her way of giving back to the community that helped shape her. “It is important for our youth to know that people care about them and want to organize activities that they will enjoy,” says Blackbird-Riley, a second-year student in Laurier’s Kinesiology and Physical Education program. 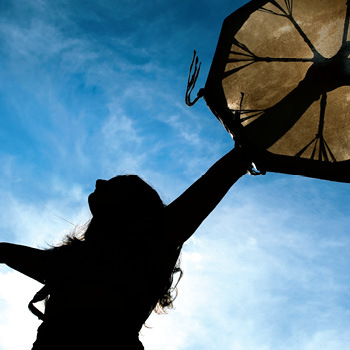 Demonstrating care for Indigenous university students is the reason a group of faculty, staff and students from Laurier, the University of Waterloo and the University of Guelph launched the SUNDANCe award in 2006. Ireland says the original SUNDANCe committee organized various outreach events to educate the region’s campus communities about Indigenous issues. The events were successful, generating enough profit to create an endowed Indigenous bursary. Representatives from each institution’s Indigenous student centres meet yearly to review the applications and disperse the awards. Blackbird-Riley was one of four SUNDANCe award recipients in the 2017/18 academic year and the only one from Laurier. Log on to LORIS to learn more about the awards, application criteria and deadlines. Questions about Laurier’s scholarships, awards and bursaries can be directed to servicelaurier@wlu.ca. Prospective and current Indigenous students can also seek support from staff in Laurier’s Office of Indigenous Initiatives.